There is no question that access control makes your building more secure. With features that extend beyond physically keeping people out, access control increases your security in ways that you may not have considered. It was easy to think of more than a few reasons why it is worth considering access control as part of your overall security strategy. Well, the name pretty much says it all with this one. Whether you are looking to keep unwanted visitors out of the building or restrict employee access within the building (think server or stock room) access control can help. Your staff, your stock, and your building are all safer with access control in place. With electronic cards, you no longer need to keep track of who has keys or worry that they are being reproduced. Gone are the days of giant key rings and calling a locksmith to re-key or replace locks when a key goes missing or an employee leaves on less than ideal terms. With Access Control, it is easy to de-activate a fob that is lost or no longer needed. It can be done in seconds, and can even be completely remotely with a hosted solution. Not only are you saving money, but also the hassle that comes along with new locks, service appointments, and distributing new keys to staff. With access control, each swipe is logged in history, and you can easily pull reports showing who accessed what areas and at what time. You have a complete audit trail at your fingertips and can see which route visitors took through the building or which staff entered the stock area on a specific day. Unlike traditional keys, you can’t pass off your fob with any anonymity; the user name is always tied to the fob and someone is always accountable. With custom reporting options, you can run reports to find out if you have active fobs that have not been used in 6 months, or see if employees are trying to unlock doors that they have not been granted access to. Once you give out a key, that key can unlock the door and grant access to the building anytime of the day or night. Since we have already established that access control offers many benefits that traditional keys cannot, here is one more. With access control, you are able to specify times of the day and days of the week that a fob will work. For example, your frontline retail staff may be able to access the building only until 6pm, where your delivery drivers are able to access the building 24/7. If you have ever had to drive to the office to unlock the door for someone during a snowstorm, you will certainly appreciate this feature. 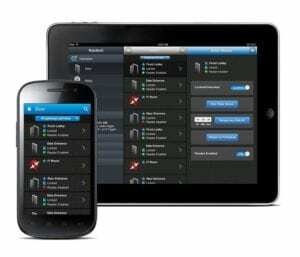 With a hosted solution, you can easily lock or unlock a door from anywhere using your smartphone or computer. Whether you are letting in a contractor or helping out an employee that forgot their card, this option is convenient and secure. Access control can be integrated (pending compatibility) with your existing Video or Security Solutions to maximize the value of security that is already in place. Have your alarm system disarm when the first person swipes their card for the day, or set up video surveillance to capture an image when a door is entered or a de-activated fob attempts to unlock a door.